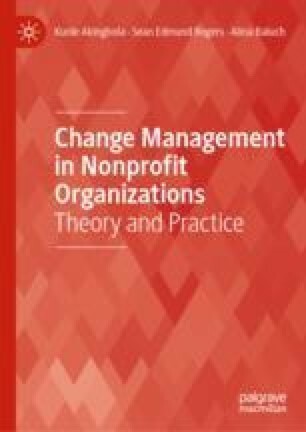 The characteristics, pace and the varied drivers of change point to the need for nonprofit organizations to explore and at least consider different nonprofit specific change strategies. One of the leading examples of nonprofit specific change strategy is the adoption of social enterprise to help the organization to adapt to change in the external environment. The chapter examines the concept of social enterprise in relation to change in nonprofit organizations. It explains the dimensions of the explanation of what is social enterprise by highlighting the definitions and examples of social enterprise in the USA, Canada, and the UK. The major influences that contribute to the development of social enterprise emphasize the role of change. Similar to many of the factors and practices in nonprofit organizations, the external environment is a major driver for the adoption of social enterprise. As a concept and practice, social enterprise in nonprofit organizations is the convergence of entrepreneurship and self-sufficiency that are based on individualism and social movement which is the hallmark of collective action. Although it offers a source of tremendous opportunities, social enterprise as change strategy could portend significant challenges that counteract its benefits. Thus, nonprofit organizations must find ways to mitigate the challenges of social enterprise in order to deploy it as an effective change strategy. Bruneel, J., Clarysse, B., Weemaes, S., & Staessens, M. (2018). Breaking with the Past: The Need for Innovation in the Governace of Nonprofit Social Enterprises. Academy of Management Perspectives. https://doi.org/10.5465/amp.2017.0176. Dees, J. G. (1998). The Meaning of “Social Entrepreneurship”. The Fuqua School of Business, Duke University. https://entrepreneurship.duke.edu/news-item/the-meaning-of-social-entrepreneurship/. Eva’s. (2018). What We Do. https://www.evas.ca/history/. Fair for You. (2017). Who We Are. https://www.fairforyou.org.uk/who-we-are/. Retrieved December 2018. Social Enterprise Alliance. (2018). Social Enterprise. https://socialenterprise.us/about/social-enterprise/. Retrieved December 2018. Social Enterprise Council of Canada. (2014). http://secouncil.ca/. Social Enterprise, UK. (2016a). What Is It All About? https://www.socialenterprise.org.uk/What-is-it-all-about. Retrieved December 2018. Social Enterprise, UK. (2016b). Fair for You. https://www.socialenterprise.org.uk/fair-for-you. Retrieved December 2018.